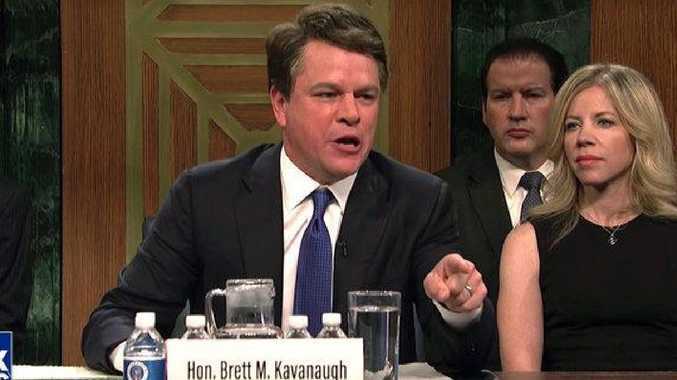 MATT Damon played a sniffing, fuming Brett Kavanaugh testifying to the Senate Judiciary Committee during the 44th season premiere of Saturday Night Live. Damon entered as the Supreme Court candidate and began reading from his prepared remarks, reports the New York Post. "Let me tell you this, I'm going to start at an 11 and I'm gonna to take it to a 15 real quick," he said. 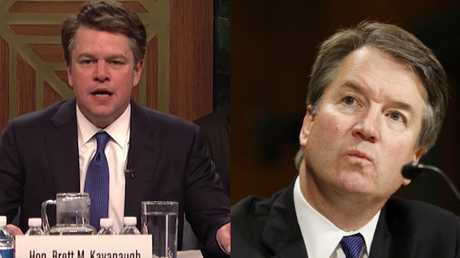 The similarities between Damon and Kavanaugh are uncanny. Addressing the panel of senators played by the show's cast members, Damon said he wrote the opening speech by himself "while screaming into an empty bag of Doritos". "I'm usually an optimist," Damon sneered. "I'm a keg-half-full kind of guy, but what I've seen from the monsters on this committee makes me want to puke - and not from beer!" Damon landed the laughs on SNL. "I'm here because of a sham perpetrated by the Clintons, George Soros, Kathy Griffin, the gay mafia and Mr Ronan Sinatra," he said. He discounted the testimony of Christine Blasey Ford, who alleges Kavanaugh held her down on a bed and groped her during a high school party in 1982. "Dr Ford has no evidence - none," he said. "And meanwhile, I've got these calendars. These beautiful creepy calendars. I'm lifting weights with P.J. and Squee. But you don't care about that, do you? You just want to humiliate me in front of my wife, my parents and Alyssa Friggin Milano?" This article was originally published in the New York Post and is reproduced with permission.